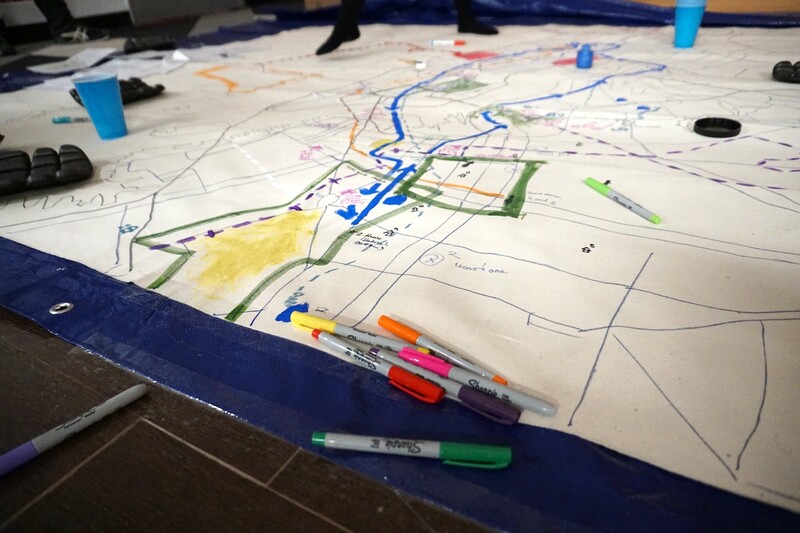 St. Louis Map Room is a pop-up community space for map-making and dialogue around civic data. Maps can be powerful tools for presenting data. Take for example The Racial Dot Map, which draws a dot for every single person in the USA and colours it according to their reported racial group. The map tile interface makes it easy to zoom in and find that one dot that might be you; it’s a good demonstration of how maps can be useful for framing a single point within a dense and detailed geography. What maps tend not to be good at, though, is allowing viewers to understand other points of view. 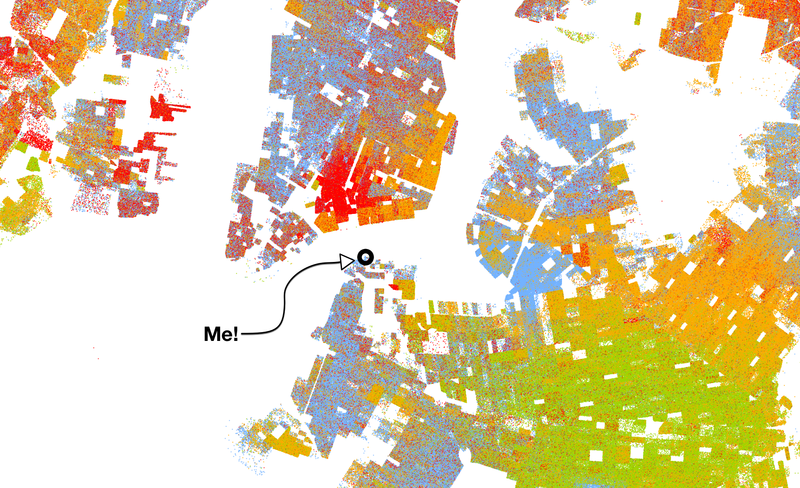 I’m very unlikely to use the Racial Dot Map to look at another neighbourhood in NYC other than my own, and even less likely to look at another city, or a suburb or (gasp!) a rural area. The way that I use this or any other map is very much constrained by my own lived experience. On top of this, the way I typically experience maps (mostly on a mobile phone screen) limits my engagement to a one-person act; maps are a hard thing to have a conversation around. Finally, since I had very little say in how this map was made, I’m constrained by the biases and politics of the map and the data placed on top of it. Inspired by collective drone-based crisis mapping efforts in Nepal, a 1947 keynote speech by a librarian about imagination, and the rich (and often troubled) geographic history of one of America’s greatest cities, we are elated to be opening St. Louis Map Room on March 3rd. Sited in a shuttered public school in St. Louis’s Vandeventer neighbourhood, Map Room combines hi-tech cartographic robots with analogue art materials to make a pop-up space for map making and dialogue around civic data. 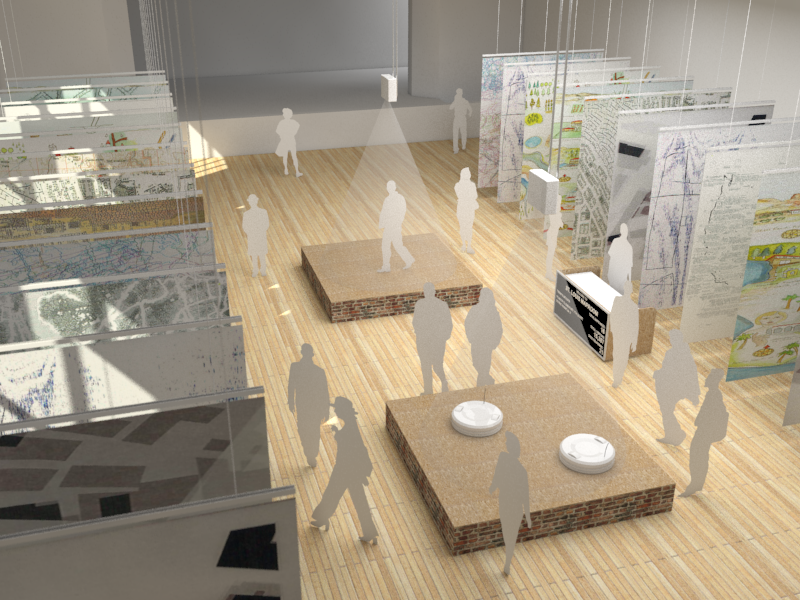 Render of the Map Room space in Stevens Middle School. Actual Map Room may vary. Over the course of forty days, community groups — students, activists, city workers, organizers, veterans, immigrants, seniors, bird watchers, cyclists, mayoral candidates, and more- will convene at the Map Room to make fifty 10 by 10 foot maps, each inscribed with locations, routes and other geographic artifacts of the group’s lived experiences and narratives in the city. A group of high school students might collectively author a map about how they get to school in the morning. Staff from a homeless shelter could create a map of undocumented community resources for people living on the street. An alderperson and her team might draw out their vision for the future of a particular neighbourhood. The choice to make maps at this large scale is deliberate. While phone screen sized map invites engagement from a single individual, a 100 square foot map encourages different interactions. Groups of people can gather around a map to look at it from different vantage points. People can walk across the map, experiencing distance in a meaningful way. Map Room allows for social consumption of civic information — just as we might gather around a dinner table to talk politics, participants can gather around data to talk about their city. These giant community-authored maps can then be used by map-makers and visitors as instruments to explore a wealth of city data, from historic maps to census reports to live transit feeds. Traffic data can be overlain onto students’ routes; a map of population change can be placed on top of a politician’s future plans. In this fashion, individuals can see how their own lives intermingle with millions of data points. 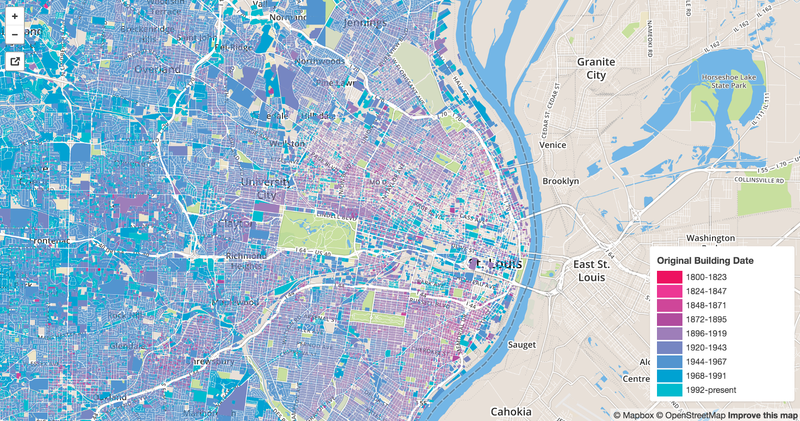 By using maps made by others, participants can put themselves into the shoes of their fellow citizens and see how St. Louis’s data landscape changes when it is viewed from another perspective. We’ve assembled an impressive collection of maps and map-based datasets, including dozens of historical maps and more than 30 data collections concerning civic conditions such as land use, school proximity, racial diversity and population change rates. 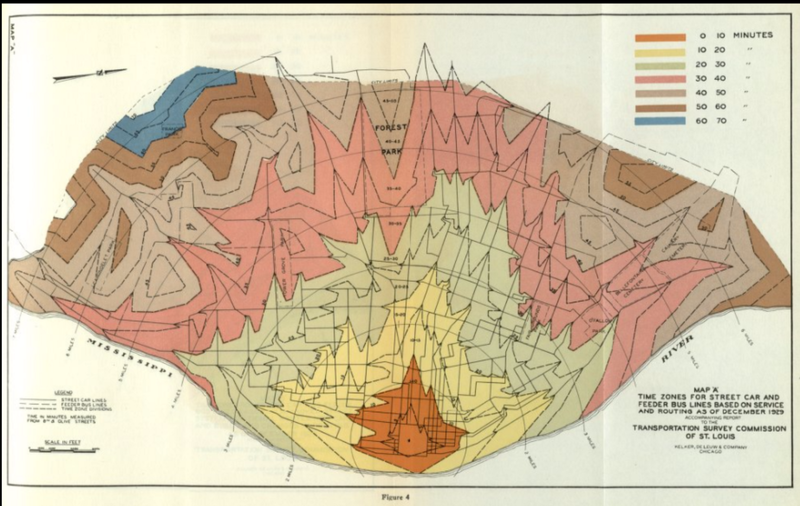 Each of these data sets of information can be layered on top of any of the fifty handmade maps, offering a rich possibility of intersection between human experience and hard data. While these datasets and maps are all publicly available, they are not easily found in the actual public. By bringing the maps into this very public space we’re giving them a chance to speak and be spoken to outside of their usual constraints of medium (only available on the web or through a complicated API) and audience (only going to be seen by a specific readership). At the end of the forty days, Map Room will seek to leave a few interesting legacies. First, the community-authored maps will become part of the City of St. Louis’ official archive, sitting beside other maps and documents that have defined the way the city has grown. Second, we’re open sourcing the entirety of map room (everything from software code to hardware plans and school curricula) so that other cities and communities can create their own spaces for data, maps and dialogue. St. Louis Map room might beget a North Philadelphia Map Room, or a Bogata Map Room, or a Chengdu Map Room. 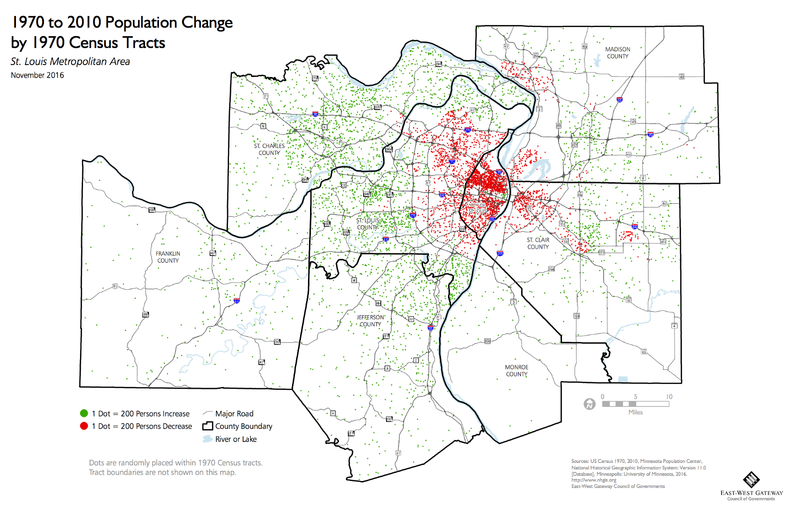 Finally, St. Louis Map Room offers the possibility for a discussion about cities and communities, informed by data, that happens outside the rarified worlds of tech departments and hackathons. We’ve heard a lot over the last decade about how cities will become smart in the wake of big data. Map Room envisions a future for the city that is also wise as a result of a shared understanding of lived experience amongst its citizens. St. Louis Map Room runs from March 3rd to April 9th at Stevens Middle School. For more information visit stlmaproom.org. Map Room is a collaboration between The Office For Creative Research and COCA, in partnership with the St. Louis Public Schools with support from the Regional Arts Commission, PNC Arts Alive and the Missouri Humanities Council. For press info and other inquiries, or if you are interested in hosting a Map Room in your community, contact information@ocr.nyc.